Mine sites in Australia are some of the toughest workplaces in the world. In most cases, they’re many kilometres from the nearest town and in the nation’s north, are often operating in extreme weather conditions. This makes transporting staff to and from site challenging, especially in areas where roads are unsealed or at best rough. This is when you need reliable light transport vehicles which are covered by the support of a local company with national outreach. At Rentco, we pride ourselves in offering the best quality rental equipment on the market, backed by a 24/7 national breakdown support service. When you’re operating in a tough environment, we understand that any onsite vehicles have to be equally tough. This is why we have assembled a fleet of bus hire vehicles including a 12 seater people movers that tick the boxes for Mine Spec requirements and are ready to operate in diverse mine site conditions. - Reflective Safety Tape and Call Sign Decals. Add air-conditioning and cloth seats for a mini bus with optimum comfort. Check with your local sales and service centre to find out if these vehicles are available in your area. When you have staff working in difficult, or extreme weather conditions, you have a duty of care to make sure they’re travelling safely when they set off or return from a shift. 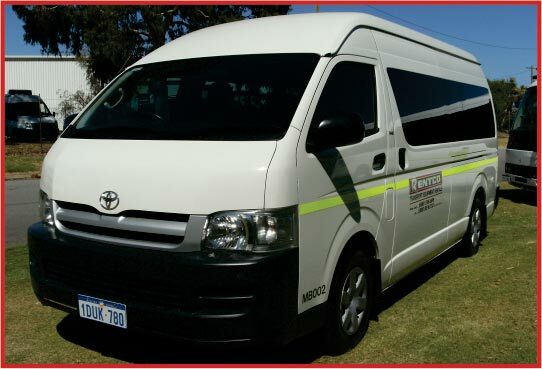 Our self-drive 12 seater mini bus is the perfect solution for getting your crew safely to where they need to be, on or off site. - Transport time can be used to brief employees on site, safety or work issues. Have a group of people to move? Hire a people mover! Airport pickup’s, hotel or conference transfers and corporate events are less complicated if your group can enjoy the reliability and convenience of a shuttle bus. Whatever the occasion, Rentco has a rental vehicle to meet your needs. With outlets in Perth, Adelaide, Melbourne, Sydney, Brisbane, Townsville and Darwin, you enjoy the benefit of local service and a national network.